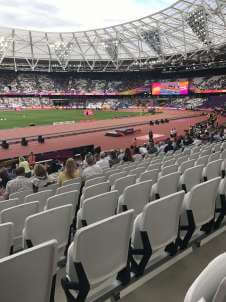 From the ratings submitted, Seat Blocks at Queen Elizabeth Olympic Park have been given an average rating of 3.2 out of 5. This is how our site users rate the seat blocks at Queen Elizabeth Olympic Park. Seat block 105 gets the best rating at Queen Elizabeth Olympic Park. Click for more information. 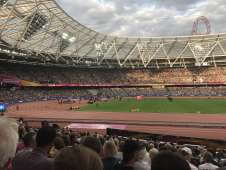 The Olympic Stadium at The Queen Elizabeth Olympic Park is iconic in its design. The roar of the Olympic spectators still resonates through the stadium. 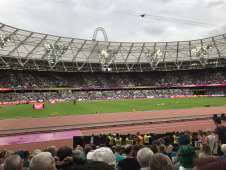 In 2015 The Olympic Stadium will be hosting games for the Rugby World Cup. Seat blocks are arranged around the stadium field. They are numbered anticlockwise from 102 - 115, 117 - 121, 123 - 127, 128 - 156. An intermediate tier of seating, Seat Blocks M01 - M15 are positioned for a great view of the track home straight. These blocks are closest to the field. Behind these are Seat blocks 201 - 256. 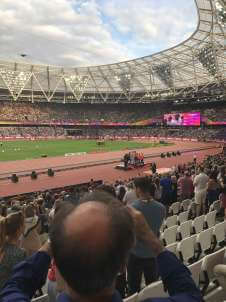 We currently do not have any events listed at Queen Elizabeth Olympic Park, please click on a seating plan for more information about seat locations at Queen Elizabeth Olympic Park.